required to submit HIS-Admission and HIS-Discharge records on all patient admissions and discharges at their Hospice regardless of the patient's payer source, age, or where the patient received Hospice services. To incentivize compliance, the Annual Payment Update (APU) was reduced by 2 percentage points for any Hospice that did not comply with the quality data submission requirements beginning with Fiscal Year (FY) 2014 and each subsequent FY. It is interesting that the performance level is not a consideration when determining compliance and APU reductions; instead, it is the act of submitting data that determines compliance with Health Quality Reporting Program (HQRP) requirements. 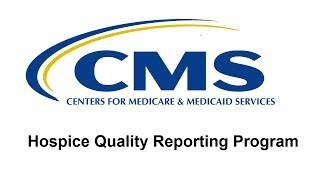 To comply with the FY 2018 requirements, Hospice providers must have submitted at least 70% of all HIS records within 30 days of the event date (patient's admission or discharge) for patient admission/discharges occurring January 1, 2016 to December 31, 2016 (CY 2016). This percentage rate has increased to 80% for CY 2017 and will be 90% for CY 2018. An updated version of the Hospice Information Set, HIS V2.00, will go into effect on April 1, 2017. If the admission date (A0220 on the HIS-Admission) is on or after April 1, 2017, HIS V2.00 must be used. To summarize the HIS revisions, there are a total of seven new items which will affect the skip patterns in accommodating the additions. A new section, O- Service Utilization, has been added to collect data regarding Routine Hospice Care (RHC) within the last seven days of life. No items were removed. In Section A. Administrative Data, two new items were added that are needed for public reporting and recording matching/management. These items are A0550 - Patient ZIP Code and A1400 - Payer Information. “The determination of whether or not pain is an active problem may be made by the assessing clinician, based on patient-specific findings. In determining whether pain is an active problem for the patient, clinicians may need to consider factors beyond pain severity at the time of the clinical encounter, such as historical report of pain, reports of recent symptoms, current treatment for pain (pharmacologic and/or non-pharmacologic), etc. It is possible that the clinician may determine pain is an active problem for the patient, even if pain is not present during the clinical encounter. Generally, clinical documentation that the patient is currently taking pain medication is evidence that pain is an active problem for the patient (but) comfort kits or pre-printed admission orders alone is insufficient evidence to determine pain is an active problem”. The disciplines for which visits must be reported are Registered Nurse, Licensed Practical Nurse, Physician (or Nurse Practitioner or Physician Assistant), Medical Social Worker, Chaplain or Spiritual Counselor, and Aide. It is significant that they separated the nursing disciplines but combined physicians and physician extenders. Because the Service Utilization Items are similar to data submitted on the Hospice claim, it is prudent to avoid data discrepancies.